Okay, the category is ‘food’ but the focus is more on ‘drink’ (sorry not sorry). Just seems right that somebody take the guy torturing celebs with The World’s Hottest Wings on a tour-de-beer that includes some KILLER spices. 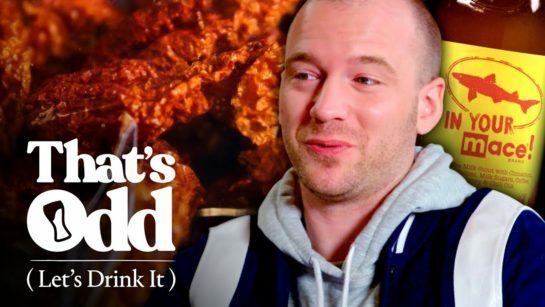 Sean Evans is the perfect guinea pig for one of Dogfish Head brewmaster Sam Calagione’s craziest recipes to date: In Your Mace, a pepper spray-infused stout custom-made for someone who has eaten the spiciest wings on the planet. Before unleashing this diabolical creation on Sean, Sam warms him up with a crash course in how to pair spicy foods with beer. Then, the duo decides to kick things up even further by running the Mace-spiked beer through a special contraption stuff with Carolina Reapers, Chocolate Bhutlahs, and a boatload of other peppers from chile guru Smokin’ Ed Currie.